Records for both print and online books, journals, newspapers, conference proceedings, sound recordings & scores, videos, archival collections, databases, maps, and more. Links to individual journal or newspaper articles. For article searching you can start your search at our Articles & Full Text search. Material owned by other libraries and institutions. For locating and requesting this material use WorldCat. See the Expanding your search section of this page for information on accessing these tools through the Library Catalog. The search is a general keyword search with all words entered needing to appear in the record for it to show in the search results. Put exact phrases in quotes: "financial aid"
Use the facets on the left hand side to further refine your results by date, language, format, etc. Truncation and wildcards are not currently supported in basic search. Word stemming that includes common suffixes is done automatically for most words. For example, a search for star will include stars, starred and starring. Results can be filtered by date, language, format, etc., using the facets on the left side of the page after submitting the search. Truncation and wildcards are currently supported in advanced search. Word stemming that includes common suffixes is done automatically for most words. For example, a search for star will include stars, starred and starring. Searches can be performed using the wildcards ? and *. The question mark (?) will match any one character and can be used to find Olsen or Olson by searching for Ols?n. The asterisk (*) will match zero or more characters within a word or at the end of a word. A search for labo*r will match, for example, labor, labour, laborer, labourer, etc. When used at the end of a word, manage* finds manager, managers, management, etc. Important to know: Any terms retrieved using either * or ? characters are not considered when sorting your results based on relevance (the default). For example, your search for 'bio*' could return occurrences of any or all of these terms: 'bionic' or 'biosynthesis' or 'biodegrade' or 'biographic.' One, some, all, or none could be relevant to your research. 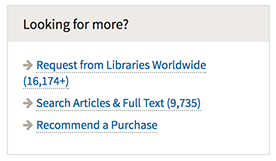 If you are not finding an item in the Library Catalog, or want to expand your search to include articles or items available from non-Cornell libraries you can use the "Looking for more" links in the top left of the Library Catalog. The results at Libraries Worldwide will run your search in the WorldCat Catalog where you can locate and request items for delivery via Borrow Direct or Interlibrary Loan. The articles link will run your search in our general article search powered by Summon. From your search results click on the Select button to the right of each item. Once you have selected all of your items, go up to the Selected Items link to get to a page where you can print, email or export multiple citations to Endnote. A link to text the call number to your mobile device is available next to the call number of each item on an individual record.